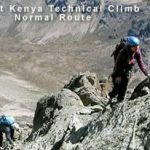 Best climbing time – Christmas to mid March. Standard: IV inf. 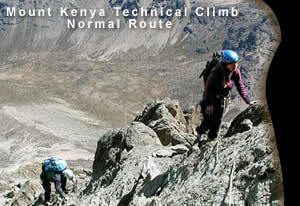 The route is rather complex, and much of the climbing is not above grade III. The Gate of Mists may be IV. An ice axe and crampons are recommended. Through out the climb care must be taken to avoid dislodging loose stones. 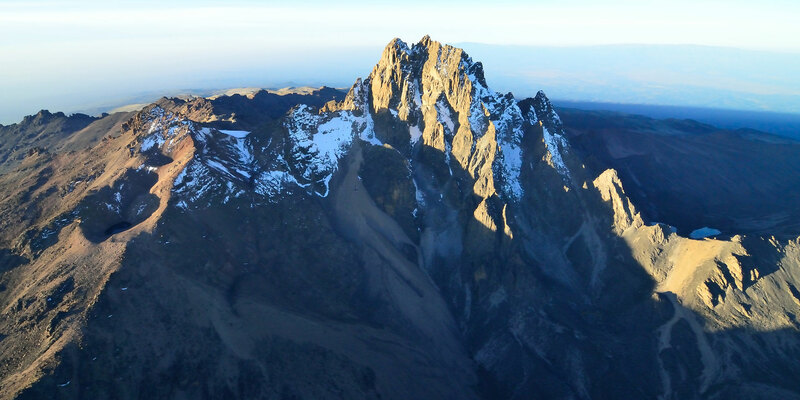 Time: Allow 6-7 hours for the ascent of Nelion and a further 3 hours for reaching Batian and returning to Nelion. 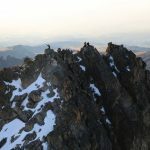 It is advisable to spend a night to the Howell Hut on the summit of Nelion. 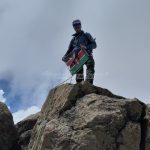 Leave Nairobi at 8.00 am to Nanyuki, which normally takes 4hrs drive, arriving at 12.00, then proceed to Mt Kenya National Park Sirimon gate, picnic lunch will be provided.After lunch, follow the track uphill for 10 kms, forking left at the junction to reach Old Moses camp which is situated at 3,300m. The ascent from Sirimon gate to Old Moses is 690m. Dinner/overnight. Old Moses Camp[judemeirs] 3300m-Likii North camp-3993m. After breakfast, leave at 8.00 am, follow the directions for the direct route, until you reach the fork after one hour. 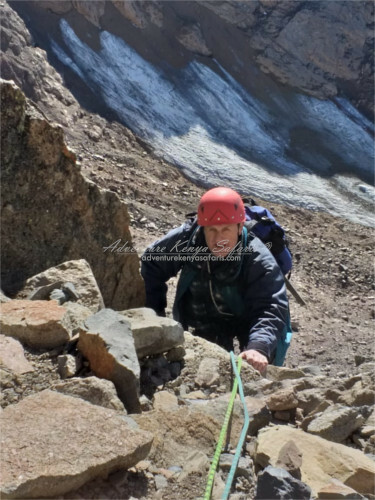 The track becomes a path, and swings right and south round the head of a large valley, crossing several small streams to reach the crest of the ridge between the Otulili and Likii North Valleys. 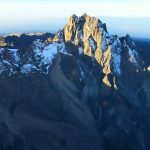 A walk of 3 to 4 hours to Likii North hut at 3,993m. Dinner/overnight. 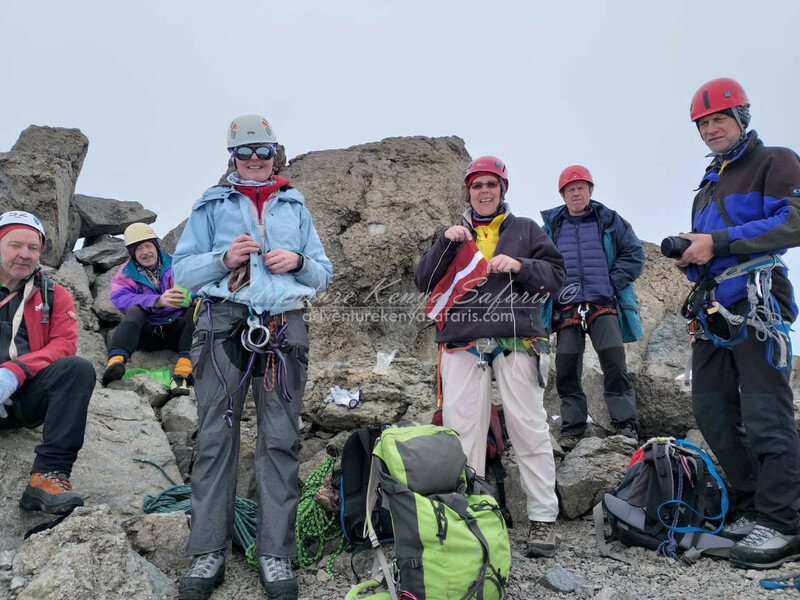 After breakfast, ascend the west side of the Valley, over a ridge, then down into the Mackinders Valley to meet the direct route, taking one to two hours. 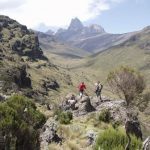 From here, follow the Mackinders Valley to reach Shiptons camp, a total of 4 hours from Likii to Shiptons camp at 4,250m. Dinner/overnight. Wake up at 2.00 a.m., have tea and biscuits, then leave at 3.00 a.m. for the Lenana summit. This section is a long, hard slog, and the path is indistinct in places. Continue walking across a tough scree, until you come across Harris Tarn. From Harris Tarn, continue up the north face of Point Lenana reaching the summit after approx., 45 minutes at 4,985m, for the sunrise at 6.30 a.m. After enjoying the views and taking your pictures, descend down to Austrian hut 4700 m (This will be your base camp before climbing Nelion) Dinner and overnight. 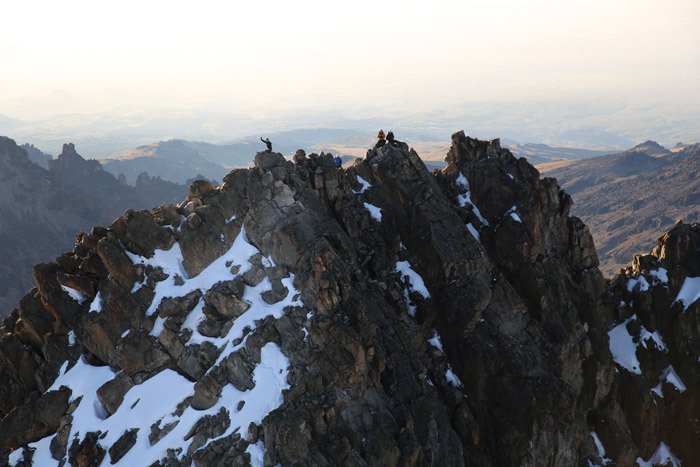 NB: If you are a quick climber, you can do it with only one day without spending a night. Wake up 3.30 am and have tea and biscuits. Leave at 4.00 am, cross the Lewis glacier and up to the base of Nelion, which normally takes 2 hours. 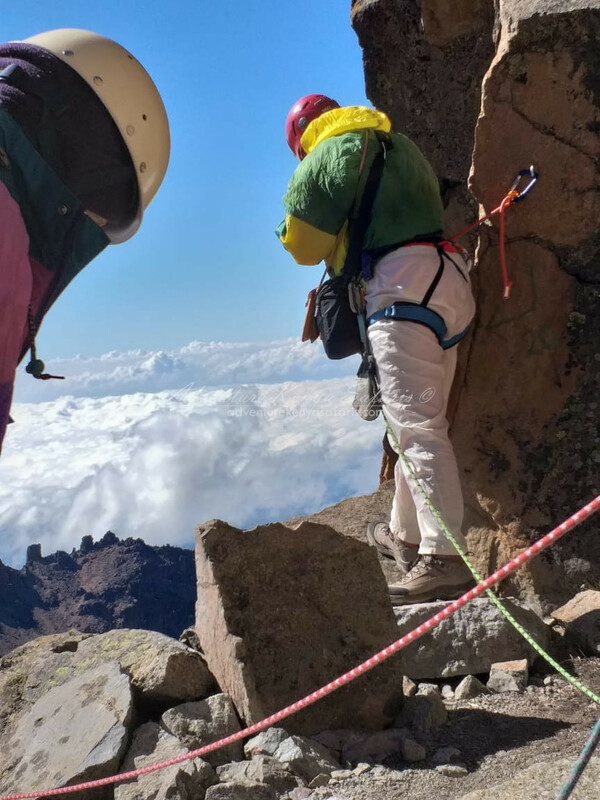 Start your climb at 7.00 am until you get to the top at 1.00pm. Traverse the gate of mist to Batian and then return to Nelion. 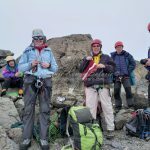 Dinner and overnight at Ian Howell hut at 5100m. Austrian Hut-Mintos hut [Halls Tarn] 4200m. Abseil down to the bottom about 9 ropes, 50 metres, and then walk to Austrian Hut for breakfast. 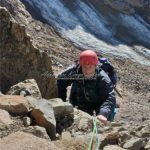 After morning breakfast, continue walking down to Mintos hut at 4200m for dinner and overnight. 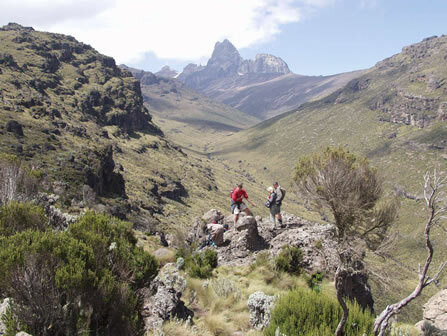 After breakfast, descend down to Meru Mount Kenya Bandas above Chogoria, following the Gorges Valley. It will take 5 hours to reach the bandas. Dinner/ overnight in the bandas with hot showers and a well earned sleep. After morning breakfast, continue walking down through the bamboo and indigenous forest reach Bairunyi to meet up with your transport back to Nairobi. 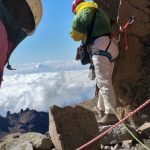 Our local guide has the knowledge and experience of the climbing routes on Nelion & Balian peaks also with verbal information and local knowledge. 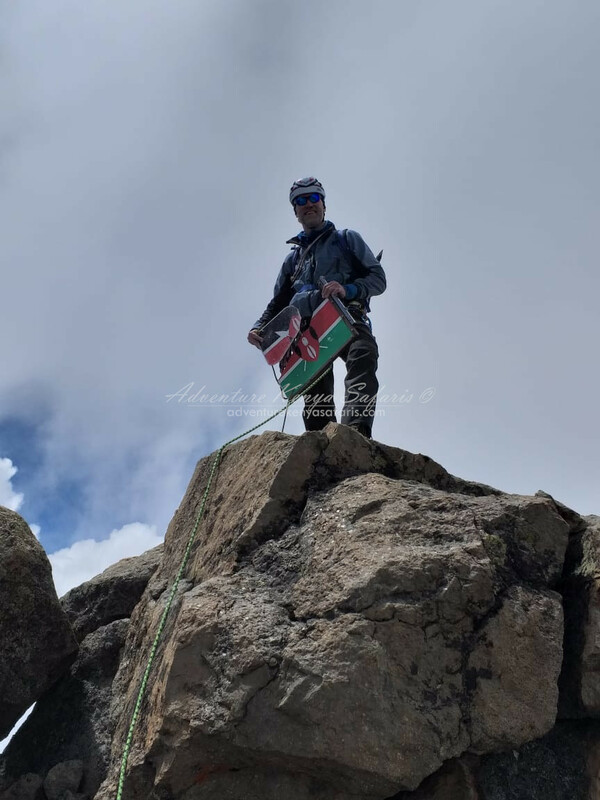 © Adventure Kenya Safaris 2019, Powered by Jabari.